We’ve all heard the saying “an apple a day keeps the doctor away” – and for good reason. With only about 80 calories in a small apple, they also contain healthy nutrients like fiber, vitamins and minerals. When it comes to cooking, apples have many uses– a delicious addition to both sweet and savory recipes. Braeburn: Red-orange color with a touch of yellow. Crisp, juicy and sweet with a hint of spice. Great for snacking and salads. Cortland: Red color with some green. Sweet with a little bit of tart flavor, not as crisp as other apples. Good for snacking, salads and baking. Empire: Dark red color. Juicy, crisp with a sweet-tart flavor. Good for any type of dish. Fuji: Red and yellow color. Firm and very sweet. One of the most popular apples that are delicious to eat raw. Gala: Red color with yellow throughout. Crispy, juicy and very sweet. Another popular apple that’s best eaten raw. Golden Delicious: Light yellow color. Sweet and crisp. Good for snacking and baking. Granny Smith: Light green color. Very tart and firm. An excellent baking apple! Honey Crisp: Light red color with yellow background. Crispy, juicy and sweet. A new variety that’s quickly become a popular snacking apple. Also good for salads and applesauce. Jazz: Red color with some yellow background. Sweet and tart, very crisp. A great snacking apple. Jonagold: Red color with light yellow top. Firm, juicy and sweet-tart flavor. Great for both eating raw and baking. McIntosh: Deep red color. Tart, juicy and very soft texture. Best eaten raw or to make applesauce. Pink Lady: Light red-pink color. Juicy and tart with a bit of sweetness. Best for eating raw. Red Delicious: Shiny, dark red color. Heart shaped with knobs or “feet” at the bottom. Sweet and juicy – one of the most well-known apples. Best eaten raw. Rome Beauty: Bright red color. Firm with a touch of tartness. Not great for eating raw, best for baking. 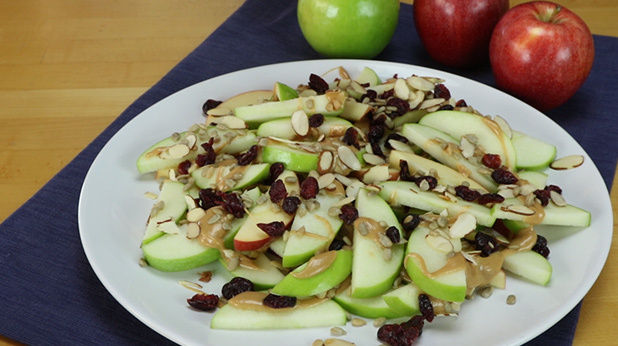 Snack on apple slices with peanut butter (compare labels to find one without added salt or sugars). Make applesauce by cooking chopped apples with cinnamon and nutmeg. Make a salad with chopped up apples, walnuts, balsamic vinegar and spinach. 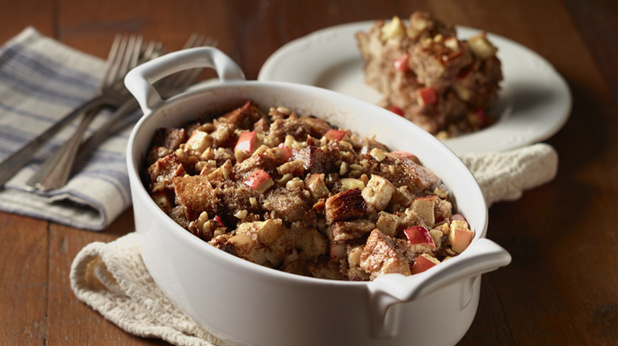 Add diced apples to your homemade turkey meatloaf. Mix canned, low sodium tuna with chopped apples, celery and ¼ teaspoon or less Dijon mustard for a sandwich or salad. Slice thin and layer apples with low sodium turkey, low fat, low-sodium cheese and lettuce on a whole wheat tortilla wrap. Blend chopped apple, frozen banana, low fat, no added sugar vanilla yogurt and orange juice for a refreshing smoothie. Stuff an apple (with core removed) with raisins, cinnamon and oats. Cover with foil and bake at 325 degrees F for 45-55 minutes. Fresh, Frozen or Canned Fruits and Vegetables: All Can Be Healthy Choices!